Lets you manage servers and workstations from your local computer. AWRC does not require that you install any software on the remote machine. This turns the software particularly useful for accessing remote machines without any previous preparation. With AWRC you have the knowledge and capabilities to do virtually anything on the remote computer.Supports multiple monitors (up to 10) on the remote computer, you can view and work on any of them. ...... With AWRC you have the knowledge and capabilities to do virtually anything on the remote computer. * Access to the remote computer desktop enabling the launch of software with the mouse or keyboard. * Supports multiple monitors (up to 10) on the remote computer, you can view and work on any of them. * Simulates all keystrokes on the remote keyboard computer. * Wakes-up from screen-savers with a mouse-click or keystroke. Deals with password protected screen-savers. * Simulates the security attention sequence (Ctrl+Alt+Del) on the remote to enable logon and on the default desktop. The default hotkey is Ctr+Alt+D. Supports User Switching sessions on Windows XP or later. * Provides access to disks, partitions, folders and files. The partitions or folders are not required to be open shares. 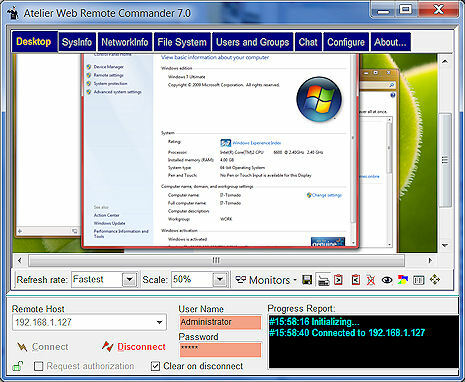 Qweas is providing links to Atelier Web Remote Commander 8.05 as a courtesy, and makes no representations regarding Atelier Web Remote Commander or any other applications or any information related thereto. Any questions, complaints or claims regarding this application Atelier Web Remote Commander 8.05 must be directed to the appropriate software vendor. You may click the publisher link of Atelier Web Remote Commander on the top of this page to get more details about the vendor.